Seller: Globe Newspaper Company, Inc.
© Globe Newspaper Company, Inc. This is a wonderful upgrade in delivery. I love it. We have waited for a real GLOBE app for far too long. This app is excellent. The new app is so much better than it has been... not perfect, but finally close enough to be worthwhile. 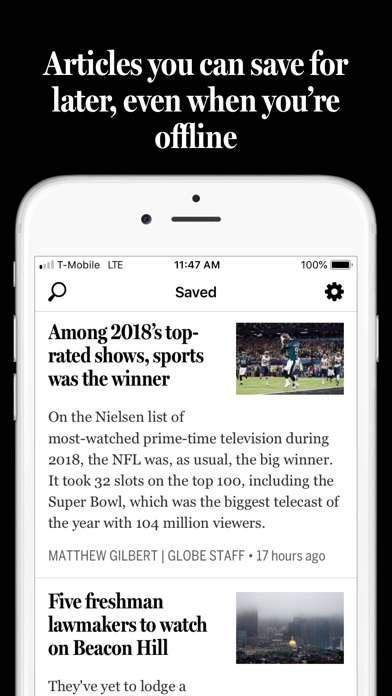 The best news apps replicate the beauty and style of the newspaper it is replicated on. This app is functional, but so ugly. I would rather look at the content on a browser. I’ve been a Boston Globe reader for decades. And an online subscriber for about 15 years. No ink on my hands, and the screen never rips. 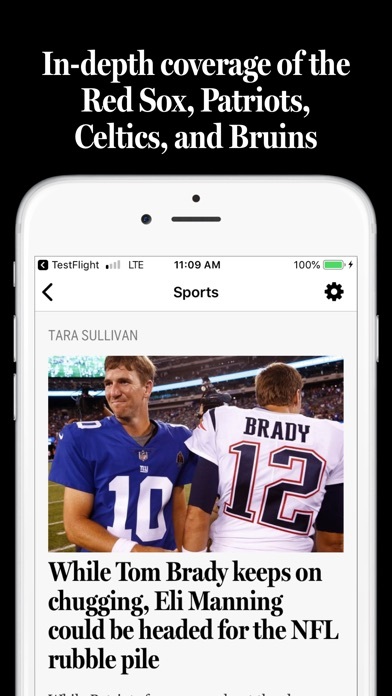 Now, with the new app everything is easy to find, content is always fresh...and the photos are spectacular! I like the option of seeing the paper format. I have been reading the Globe for about 60 years whether I lived in Boston, Maine, South Florida, Shemya, Alaska, Herzogenaurach, Germany, or my current home, Greenville, SC. Many times the paper was a day or a week old. It didn’t matter. The Globe is the best at covering local, regional, and national news on a daily basis. Sports columnists like Peter Gammons, Bob Ryan, and Dan Shaughnessy are gifts to a literate sports fan. The Spotlight team’s investigative reporting pulled back the curtain on despicable behavior by a powerful, entrenched institution. ( A shoutout to my BLS classmate Steve Kurkjian). Although I have lived away from Boston for more than 50 years, the Globe allows me to be a lifetime Bostonian. Subscribed for years. Never figured out how to find all the stories. Till now. The coverage of the Kavanaugh confirmation is bitter and partisan. An individual now needs to read 3 or 4 newspapers to develop a balanced view on an issue. The Boston Globe has sunk to new lows of sensationally liberal one sided reporting. Bummer. 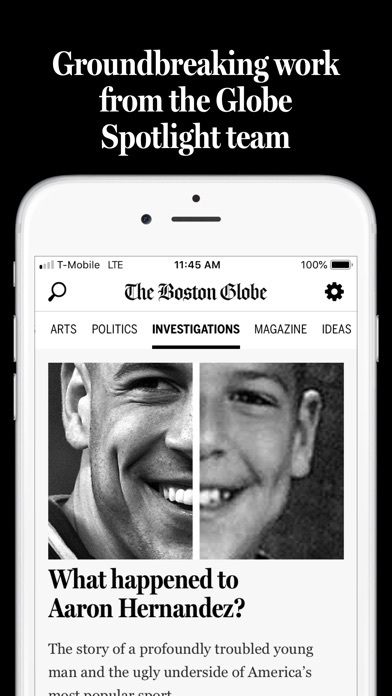 Finally, The Globe has an app worthy of its content! Feels like an app designers first attempt. Ugly design. Seems like the only “feature” is the ability to save articles. Who cares? I never need to do that. And where are the comments?! I’ll be sticking with the website. There’s no opportunity to comment on the story you just read. Guess it’s back to the old way, Bye-Bye new App, I hardly knew ya!!! Or is this option soon to be added? Keep your readers updated, please/thank you. Loads quick, scrolls easy and stories are easy to read. This is nice. I’m loving this new update. Very fast, and accessible. I can see any section I want with the click of a button. The font is the perfect size for those on-the-go reads on the bus or train. This app requires you to put up each story individually. Gone is the actual newspaper look of the old app. If I wanted just a list of individual articles I could go to CNN or many others. I preferred the old format and find this cumbersome. It’s been reworked from what it was a few years ago. So far so good! I love this app! The Boston globe gives you everything you need when you need it. I highly recommend this app. I love the Boston globe. The entire Globe, great format and easy to nav. Excellent. Slick and easy to use. Rubbish Boring interface Poorly organized sections Freezes every 2-3 articles requiring a full restart Bad app. If you want online news your subscription money is better spent elsewhere. Lags a little in navigation response, but I'm after your content. I love scrolling the photos. Takes forever to load, and scrolling locks up. Mobile site was already really good, but offline reading + weather + traffic is really awesome. Highly recommend! I like this app but frustrated that I need to log in every time even though I check "keep me logged in". Please fix. Word to the wise: if you want to read the Globe read it in your browser. This app was more trouble than it was worth. App is set up great and is easy to navigate. Bugs need to be addressed. This app constantly crashes/freezes while reading a story. Update - fixed. Good response by Globe to the issue. Worked fine until yesterday. Now tells me I'm not connected to the internet. Won't update. Please fix. I have never used this app without it freezing. Fix the bugs, especially since this is a subscription. Crashes often. Can barely read a story without it freezing. Not well organized. Can the Globe please do better? Slow, crashy, buggy. Still not optimized for iPhone 6 screens, and it's practically 2015. Either get a team that can build a proper app, or don't have one at all! I expect better from the Globe. I especially like that I can conveniently access the interesting stories from the Sunday paper on weekdays. I like this app's design a lot so far. I agree with others that navigation is a little slow and causes crashes from time to time, but other than that the layout is very nice. I also really like the notifications. I hope it gets formatted to be iPad friendly soon, and that the app icon bug gets fixed. I noticed that when the icon doesn't change, the app also crashes more, so maybe that's all related. I'm glad to have the days articles automatically download every morning, though! Better than old app. Needs work. Becomes unresponsive and scrolling locks up frequently. Jumps around as articles load so if you read faster than it loads you can get farther down the article. I'm not sure if this is because articles are loading or what. Long page loads. Freezes up intermittently for no apparent reason. Needs work to be a time-saving way to read Globe content on my phone. For any sports fan, and especially a Boston sports fan, there is no better comprehensive, in depth, sports coverage than the Boston Globe. Wish I could see reader comments. Can’t see them with this app, only with a web browser. It’s pretty much an uncurated news feed. One example, as new stories were added about the sexual harassment allegations against the head of Boston’s Catholic health care system, they were just stacked on top of each other, all topped with the exact same photo. The typography was identical for each headline. The typefaces and design are lackluster. It feels as though there’s no editor. I like the prior version much better. Allowed the user to see the full front page and move to each page from front to back if one chooses. What happened? Loads poorly. Photos too much of the screen. Can’t scan the headlines without a lot of scrolling. Go back, please. There is less content in the paper every week. I buy The NY Times once a week. Packed with content. Would be better if articles I’ve read would go away. Loads slowly, freezes, poorly organized and curated. Whoever is running digital media needs to understand this is a primary content channel. Compare very poorly with the NY Times and even the now improved WSJ app. Forget downloading a facsimile of the paper on your other app. Fix this one. Firstly, thanks Globe team for providing this for your subscribers. I’m noticing header styles (probably h2 & h3) aren’t coming through as headers, instead they look like normal body font which isn’t very helpful. Is there a better way to get the Globe on iPhone? This app is poor. The app opens, works for 1 minute and then freezes for about 1 minute. If you wait long enough it works again. Seems to be loading something in the background that causes the freeze. It's been an issue for well over a year. Despite many reviews about the issue, The Globe hasn't fixed it. Don't wast your money on this app. I finally reached the point today where I cancelled my subscription to the iPhone app for the Globe. In addition to problems noted by others (app turning off and having to be reopened, etc. ), I have experienced a litany of issues: duplicate stories, multiple duplicate stories, scrolling issues, out of date stories with no reason why there, no new stories, no rhyme or reason to what is in headlines even though only one box is checked for sections to pull from and on and on. Come on Boston Globe, you should be ashamed of yourselves! I would be willing to pay more but probably won't now - you have completely lost my trust. Are the techies looking at these comments/direct feedback? This app does not function. No updates, freezes, poor navigation. Is anyone listening????? While the quality of the content is excellent, the app freezes and crashes virtually every time I use it. I was prompted to write this review because I haven't gotten a new news story in 3 days. App needs serious work. I've been using it for about a year and have never seen any improvements. It takes forever to load, crashes consistently and freezes up when it doesn't crash. Seems to be a newspaper that knows it needs to go digital, but not put resources into actually going digital. Avoid! The app has old articles from 2014 and now seems to think it's still last Sunday even though it's Wednesday. Very disappointing. Slow, crash-prone, and just wholly unpolished. I'm mystified how a print publication can hope to survive if this is the best they can manage. Feels six years old, app-wise. Cancelled before the free trial was up. I don't understand why the Globe can't make an app that doesn't constantly freeze and need to be restarted. I can barely read one article. The NYTimes app has worked well for years. I wanted to like it. Please develop a new version that actually works. To attract younger readers and increase subscribers, this is vital. In short, this app does not work. It constantly freezes and crashes. 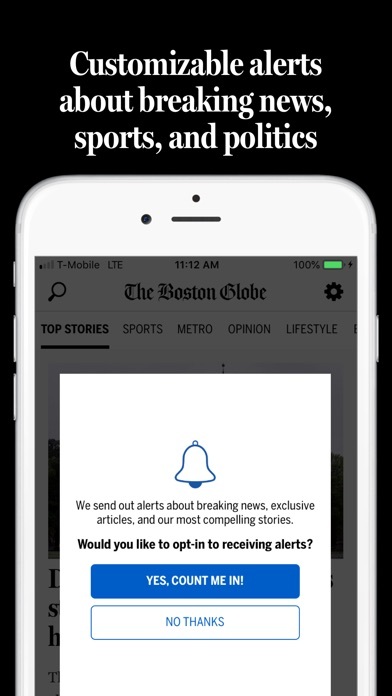 It is baffling why a publication like the Boston Globe cannot produce a workable iPhone app especially considering I pay for a digital subscription! The app presentation of over the top photos is gross and way too much. It s about the news not the pictures! Also going into “sections” cuts the view in half and the presentation again for low literacy readers. Just the news please. I bough this subscription to read this series and I can’t access it. Why is that? This new format is NOY reader friendly!! I would very much like the previous version back, which is not in a vertical form!! I love the Boston Globe and have read it every day for 45 years. I still don’t miss a day, even though I don’t live in Boston anymore. My one concern is that it increasingly seems determined to enter the culture wars, more as a participant than as an observer. I am not a habitual critic of the press, and I don’t look for liberal bias under every leaf. But I think the Globe’s news articles do tend to be slanted, and the selection of what to report or omit seems to reflect an agenda at times. In the opinion pages, liberal perspectives outnumber conservative ones by at least 4 to 1. Many columns are preachy and repetitive, more hysterical than thought-provoking. I hope the editorial board will occasionally self-reflect and remember that its more strident members do not hold a monopoly on truth and justice. Still, I love the paper and probably always will. Have read the Globe for years. The writing is informed and timely and the sports section in particular is great. First time on it completely froze.